In March of 2009, New Balance launched their worldwide “Total Fit” campaign to promote three new styles of shoes. The campaign encouraged the global athletic leader’s heritage in their performance running products and introduced philosophy to their dedication to providing the perfect fit. The campaign focused on the love/hate relationships athletes have with running. It featured advertisements on a global level as well sweepstakes for $5 off an in-store purchase. The multi-media campaign displayed ads on television, web, and print to ensure word of the new products reached performance and fitness athletes and runners. New balance aimed the promotion at 25-34-year-olds with the goal of expanding and promoting the “Total Fit” philosophy. It advertised three new styles of shoes as well as the company’s entire product line across its advertising platforms. It featured two 30-second television ads that reinforced an athletes love/hate relationship they have with running. The message of the ad was that the New Balance clothing line and 769 men and women’s running shoes will make you love running even more. The campaign extends their advertisements into print and online elements. They maintained that love/hate relationship that runners have and how the brand’s running shoes and apparel featured in the Total Fit campaign can be beneficial to them. These ads highlighted the spring running styles which are 1063 and 769. The other fashions, 758 and 1225, were featured in the same campaign during the second half of the year. Beginning in March of 2009, the print campaign was featured in vertical running/sports national and regional magazines which include Runner’s World, Running Time, Running Network, and Women’s Running. In addition to advertising the “Total Fit” philosophy, New Balance aimed to inform consumers and athletes about their 88 essential points that guarantee the perfect fit. The points analyze consumer needs first. Then the products are designed and engineered around the 88 points that include quantitative and qualitative measurements to ensure a perfect fit. 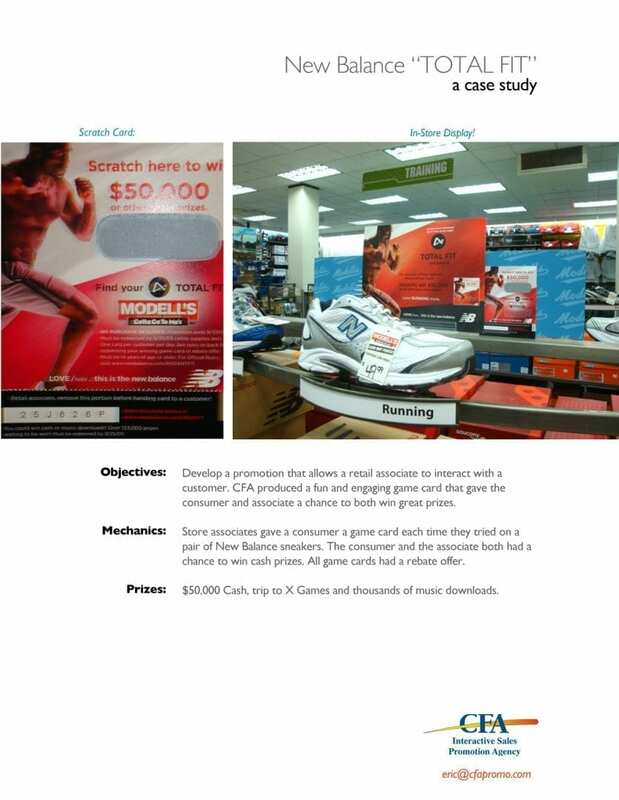 Not only did New Balance advertise online, on T.V., and in print, but they also issued point of purchase displays to all New Balance stores worldwide. These displays featured “Total Fit specialist” appearances and an instant win “Find Your Total Fit” sweepstakes that awarded $5 off an in-store purchase. Many times, decisions are made about products and purchases while in the store. That’s why New Balance incorporated P.O.P placements in the store as well as other advertisements such as posters and counter cards, premium fixtures, shelf wraps, product glorifiers, and LCD screen players that feature the same animation from the television ads. New Balance’s campaign launched in 2009 in numerous countries worldwide. The goal was to promote the brand’s three new styles of running shoes, the Total Fit philosophy, and the 88 Points of Fit. Their ads reached runners and athletes on multiple platforms on a global scale. If you are interested in campaign management and administration, CFA wants to speak with you. We are a contest administration and management company with over 20 years of experience, and we look forward to the conversation.